Android Reborn – Have you ever wanted to cut and merge mp3 songs? With the advancement of technology nowadays, it is not something impossible to do. In fact, it is easily done on Android. Just how to cut and merge MP3 on Android then? Of course, you will need to use certain applications to do so. There are many cutter and merger applications to choose. But, let us tell you how to use one as the example here. Mp3 Cutter & Merger is pretty much highly rated due to various reasons. Mp3 Cutter & Merger is light in its size, weighing only 1.2MB. It is simple and easy to follow. Not to mention, it is even free to use. Surely, these make you want to use it too, right? Then, go ahead for you can absolutely cut and merge songs with this application on your Android. To cut and merge songs with this application, there are some steps you need to follow. 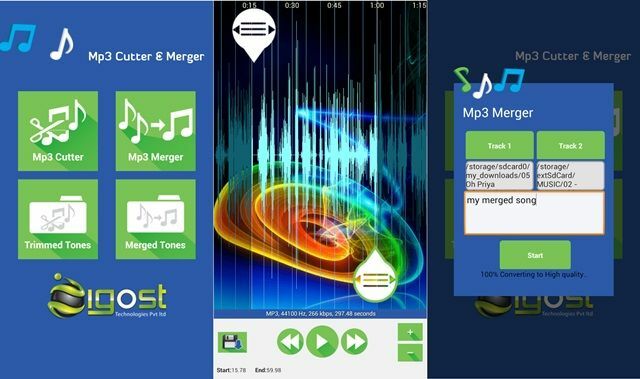 Download and install Mp3 Cutter & Merger app on your Android. Open and select the song you want to cut and merge. Set the Start and End timing to cut the song. Click on Start Cut once the timing is set. Click on Merge MP3 to merge it with other song. Add the song you want to merge with the trimmed song. There you go. With simple app like Mp3 Cutter & Merger, you can make your ringtone, fused song, mixed song, or any tones or songs you want by cutting and merging them into one. You don’t even need to do it on computer or laptop.